The detector, made of superconducting nanowires, is one of several sensor designs developed or used at NIST to register individual photons (particles of light). 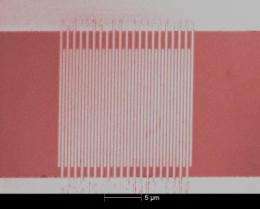 The original nanowire detector, invented in Russia, uses wires made of niobium nitride and has a detection or quantum efficiency-ability to generate an electrical signal for each arriving photon-of less than 10 percent in its simplest, most compact model. NIST's tungsten-silicon alloy version has an efficiency of 19 to 40 percent over a broad wavelength range of 1280 to 1650 nanometers, including bands used in telecommunications. The limitations are due mainly to imperfect photon absorption, suggesting that, with further design improvements, detector efficiency could approach 100 percent reliably, researchers say. More information: B. Baek, A.E. Lita, V. Verma and S.W. Nam. Superconducting a-WxSi1-x nanowire single-photon detector with saturated internal quantum efficiency from visible to 1850 nm. Applied Physics Letters 98, 251105. Published online June 21, 2011.